Ohio sophomore Nathan Rourke (12) releases a pass during the Bobcats’ win over Kansas on Sept. 16 in Athens, Ohio. NASSAU, Bahamas (AP) — Ohio coach Frank Solich knew his Bobcats were better than their record showed. You’ll get no argument from UAB. Dorian Brown rushed for 152 yards on just 12 carries and scored four touchdowns, Nathan Rourke threw for two scores and Ohio beat UAB 41-6 in the Bahamas Bowl on Friday. Ohio (9-4) averaged 38.9 points per game during the season, setting a school record with 467 points scored, and the Bobcats exhibited that prowess in the opening half of this one, using big plays to build an insurmountable 27-3 halftime lead. Brown, a redshirt senior, scored on runs of 74, 9, 25 and 14 yards, two in the second quarter and two in the third as he carried the load for injured A.J. Ouellette. Brown’s heroics were too much for the Blazers, a feel-good team seeking its first bowl victory on just its second try. The loss spoiled the end of a remarkable first season back for UAB (8-5), which was predicted to struggle and didn’t. UAB President Ray Watts had cut the football program in December 2014 because a university report deemed it too expensive. After public outcry, football was reinstated, but NCAA rules required the school to skip the 2016 season to help the players who stuck it out re-adjust to competing at the top level of college football. The Blazers, under Conference USA Coach of the Year Bill Clark, responded by winning a school-record eight games and finished second in the conference’s West Division. They won six of their final eight games. On this day, though, they ran out of miracles. The high-scoring Bobcats have a veteran offensive line with more than 100 starts and they repeatedly took advantage of that experience. 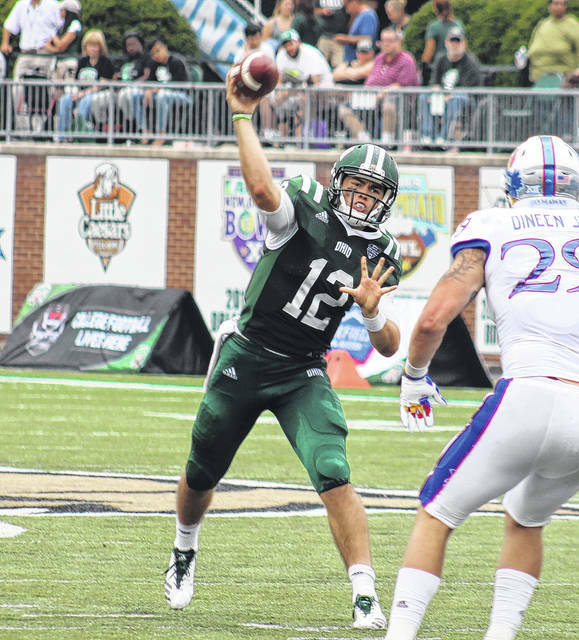 Rourke had plenty of time to throw, and when the Bobcats decided to run, holes were there. They finished with a 249-99 edge on the ground. Ohio raced to a 13-0 lead in the first quarter, pretty much sticking to the ground until the end of an 11-play drive. After the Blazers were called for two penalties in the red zone, Rourke hit DL Knock for a 19-yard touchdown midway through the period. Rourke then stunned the Blazers with a bomb. After a nifty 23-yard punt return by the elusive Papi White, Rourke took advantage of UAB’s preoccupation with the run game and hit White on a play-action pass for a 56-yard touchdown and a 13-0 lead. Brown’s 74-yard run early in the second boosted the lead to 20-0. When UAB finally mounted a promising drive, the Blazers had to settle for Nick Vogel’s 34-yard field goal midway through the second quarter. Spencer Brown, who broke the UAB school record for freshman rushing yards with 1,329, finished with 37 yards on 13 carries. UAB: The Blazers demonstrated this season that they belong at college football’s top level. If the community support that helped resurrect the program continues, the Blazers have a coach in Clark, an Eddie Robinson Coach of the Year finalist, who can take them to the postseason on a regular basis. Ohio: The Bobcats have a budding star in Rourke, who next season has a chance to lead them to their first MAC title since the late 1960s. A native of Ontario, Canada, the sophomore set single-season records at Ohio with 21 rushing touchdowns, 22 touchdowns scored and 132 points scored. Ouellette led Ohio with 980 yards rushing during the season, but he re-injured his left arm early in the third quarter and left the game with 26 yards to become Ohio’s first 1,000-yard rusher since 2012. UAB: Its 2018 schedule has not been finalized, but the Blazers are expected to open next season against Savannah State. Ohio: The Bobcats open the 2018 season at home against Howard on Sept. 1.